–усские игральные карты дл¤ обмена. Home / Russian playing cards for an exchange - page 1. The cards are created by the artist P.D.Bajenov per 30 years 20 centuries. For the first time are issued in 1967 to 150 years of the Leningrad combine of a colour seal. The cards are created in the pre-revolutionary period. Figures of figured cards in the allegorical form represent Slavic, Egyptian, Greek and Persian civilizations. The cards are created at the end of 1960 years by the artist Y.P.Ivanov. Figures of figured cards in the allegorical form represent spring, summer, autumn and winter. The cards are created in 1998 by the artist S. Spiriv. The comic image. The cards are created in 1998 by the artist B. Adjiev. Figured cards in ancient costumes of Russian, Asian, Scandinavian and Caucasian peoples. The cards are created in 1999 by the artist B. Adjiev. The cards represent the naked men both women of white and black race. 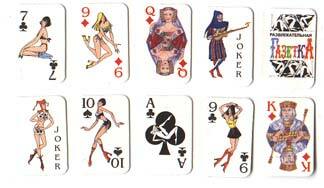 The cards are created in 1997 by the artist S.Zaytsev. Suits represent engineering and arms of overland, sea, rocket and air armies. Figured cards - in the smart and daily military form of the officers and generals of the Russian Armed Forces. The figured cards represent as cartoons of the political and public figures during presidency Boris Eltcin. Are issued in France. 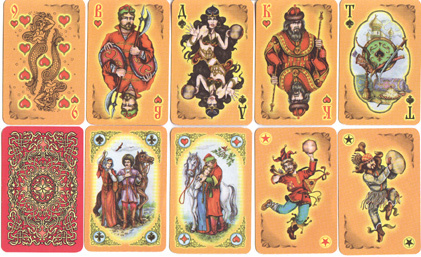 The figured cards represent as cartoons of the figures of former Soviet Union. Cards of the reduced size. Figures of cards "Russian" are used. Are represented in costumes typical of a beginning 19 centuries. The cards are created in 1911. Basis of figures of figured cards have served costumes of the participants " Historical Reception" 1903, on which emperor Nikolay II and court were in orders XV. The given packs are issued by card firm Piatnik, Austria. Figures of figured cards are represented in costumes of Ancient Russia.
" New Russian " and "Mafia"
Publishing house ScanRus 2000. Moscow. Cards - caricature on the Russian richmen and Russian criminality. The cards represent Russian costumes 18 centuries by the artist S. Grebennikov. "Smallest in the world of a card"
The cards are issued Alexandr Lutkovskiy, circulation 999 copies. The size of cards 18 on 27 mm. On cards the political figures of modern Russia are represented.